Summary: Researchers reveal how a repeating nucleotide sequence in the gene for a mutant protein may trigger Huntington’s disease. Rice University scientists analyze repeats in proteins implicated in neurological diseases. This time, Wolynes and his team were interested in knowing how the varying length of repeats — as few as 20 and as many as 50 — influenced how aggregates form. Experiments had demonstrated that sequences of 20 repeats or less remained unfolded – or “noodle-y,” as Wolynes described them; they were able to clump into a nucleus only when four or more were gathered together in proximity. Simulations at Rice show how a repeating sequence in a mutant protein may trigger Huntington’s and other neurological diseases. They confirmed the number of repeats is critical to how many proteins are needed to start an aggregate. 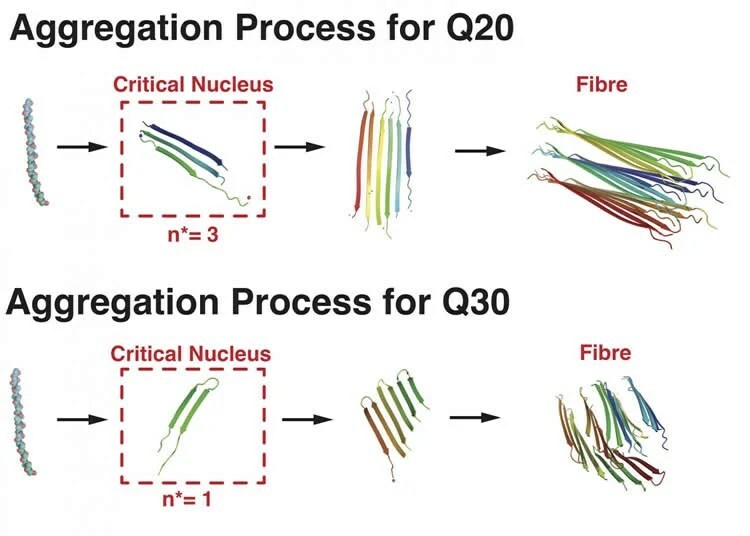 Here, 20-and 30-repeat proteins take different forms to nucleate fibers. NeuroscienceNews.com image is credited to Mingchen Chen/Rice University. Funding: The National Institute of General Medical Sciences and the Ministry of Science and Technology, Taiwan, supported the research. The researchers used the NSF-supported DAVinCI supercomputer administered by Rice’s Ken Kennedy Institute for Information Technology. Image Source: NeuroscienceNews.com image is credited to Mingchen Chen/Rice University. Rice University. “Hunt for Huntington’s Cause Yields Clues.” NeuroscienceNews. NeuroscienceNews, 10 November 2016. Rice University. “Hunt for Huntington’s Cause Yields Clues.” http://neurosciencenews.com/huntingtons-proteins-computer-model-5478/ (accessed November 10, 2016). Aggregates of proteins containing polyglutamine (polyQ) repeats are strongly associated with several neurodegenerative diseases. The length of the repeats correlates with the severity of the disease. Previous studies have shown that pure polyQ peptides aggregate by nucleated growth polymerization and that the size of the critical nucleus (n*) decreases from tetrameric to dimeric and monomeric as length increases from Q18 to Q26. Why the critical nucleus size changes with repeat-length has been unclear. Using the associative memory, water-mediated, structure and energy model, we construct the aggregation free energy landscapes for polyQ peptides of different repeat-lengths. These studies show that the monomer of the shorter repeat-length (Q20) prefers an extended conformation and that its aggregation indeed has a trimeric nucleus (n* ∼ 3), while a longer repeat-length monomer (Q30) prefers a β-hairpin conformation which then aggregates in a downhill fashion at 0.1 mM. For an intermediate length peptide (Q26), there is an equal preference for hairpin and extended forms in the monomer which leads to a mixed inhomogeneous nucleation mechanism for fibrils. The predicted changes of monomeric structure and nucleation mechanism are confirmed by studying the aggregation free energy profile for a polyglutamine repeat with site-specific PG mutations that favor the hairpin form, giving results in harmony with experiments on this system.